You don't have to speak Spanish to have a good time in Spain. It's just one of those places that you can afford to keep quiet and still enjoy yourself. 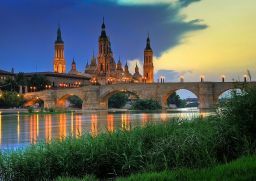 Spain offers scenic views and is a good place for the romantics. Spain offers several festivals for different tastes. There is the Festival de Patios where one can view beautiful flowers in the homes of some citizens. Holy Week takes place in different parts of Spain like Seville and Andalusia to name a few and the noted Spain Carnival is better in the Cadiz area. Indulge in the La Tomatina, which is a tomato fight in Bunol and the Sevilles April Fair is a must with its display of flamenco dancing and bullfights. Step into a culture that you have ever only dreamed about, so what are you waiting for? Spain is calling!